Context Menu Manager is an excellent tool to view and manage installed shell extensions. If available, it displays the description, as well as version details, company information, file name and more. You can optionally disable/enable any item, which can be very useful to disable an extension that you don't need or that has been left behind in your right click menu from a previous software install. 1. The Above box: shows three types of extensions in your right click menu: Files&Folders, New and Send To. 2. The Lower box: displays the description of the extensions, as well as version details, company information, file name and more. When you right-click a file/folder, there may be a huge delay before Windows displays the context menu. When you try to empty Recycle Bin (from Common Tasks), it opens Quick Finder instead. Error message "Windows Explorer has encountered a problem and needs to close. We are sorry for the inconvenience" when you right-click a folder. These problems are caused by a bad context menu handler. Context Menu Manager allows you to delete the bad shell extensions. Start Context Menu Manager, you will see "Files&Folders" menu, here you can view what in your right click menu. When you click an extension, the related information will showed below: version details, company name, copyright, file name and more. Finally find the item you never want it, click Remove button to delete it from "Files&Folders" menu. 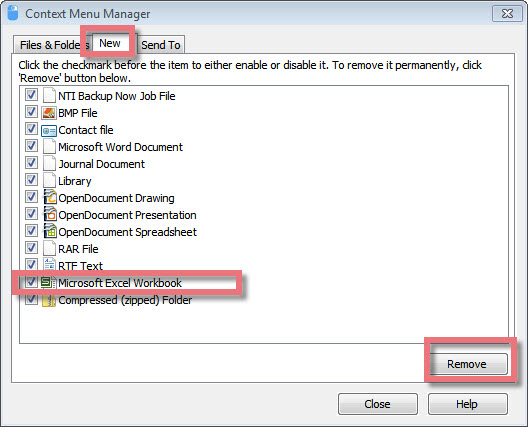 Many applications such as Office and other document based programs may add options to the New context menu. This can slow down the system since IE 4 as to generate this list it has to fetch the icons for each of the documents. If you want to delete some unless items, you can start Context Menu Manager. Choose "New" menu, and find the item you never need it, finally click Remove button to remove it from ""New" menu. How to Customize the items from "Send to"
In your right click menu, you may find some items from "Send to" menu that you never need it. How to remove these useless items? 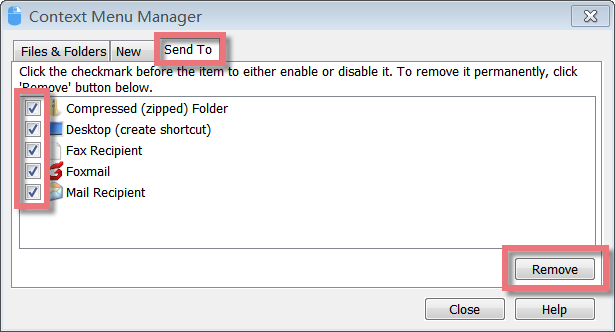 Here just start Context Menu Manager, click "Send to" menu, and find the one you never use it, finally click Remove button to delete it from "Send to" menu. Click "Context menus" under System Control, Context Menu Manager will pop up. 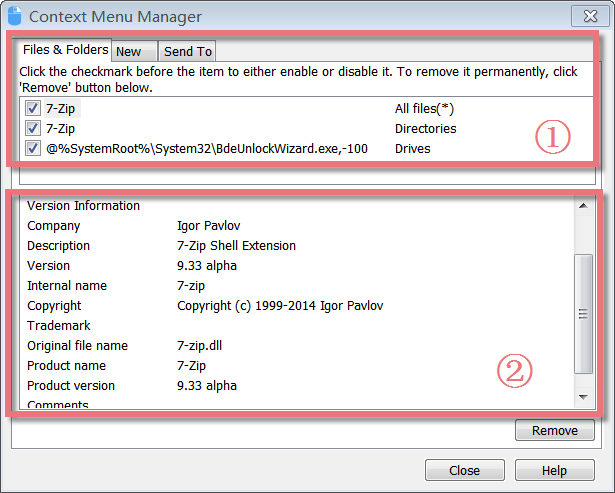 Find and click Context Menu Manager icon, Context Menu Manager will appear. Please note: if you want to add Context Menu Manager in the Dock bar, click in Dock bar, remove any icon by dragging it out of the Dock firstly, and then drag Context Menu Manager in.